I’m still recovering from HIMSS. Apparently there was a lot of craziness at the hospital while I was gone, but I’m grateful to my second in command who handled all the issues. That lets me know that they’ll be in good hands down the road. I’ve been going through my notes and arranging follow up with a handful of vendors that caught my eye. I’ve also been sorting through the scads of business cards I collected and am trying to remember who I met at which events. The week was quite a whirlwind. 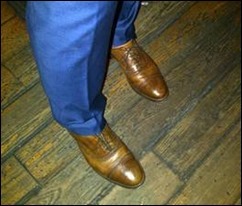 From Bright Lights, Big City: “Re: my boots. As requested, here’s a better picture. They are one of my favorite pairs of boots (my blue suede ones are killer too). Thanks for the compliment on HIStalk. I was totally flattered. The House of Blues was so much fun!” Mr. H and Lorre outdid themselves with the event. Although I wasn’t an official shoe judge, after discovering these boots I’m thinking that next year we need a “Jayne wishes she had my shoes” sash to hand out. 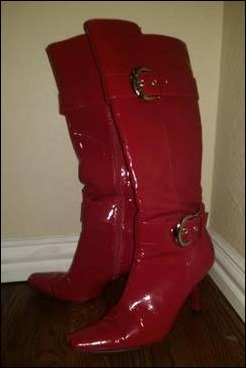 I’m also thrilled that she responded to my plea for a photo of the boots. It’s fun to connect with readers, even if it’s just email. It also lets us know you’re actually keeping up with HIStalk, unlike the two guys at the bar at the House of Blues who had never heard of Mr. H or Dr. Jayne. 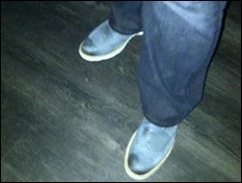 Although Nordic’s Drew Madden won our official shoe contest, a reader emailed a picture of this pair of blue suede shoes that he snapped at the NextGen party. I’m thinking they could be a contender next year. Drew also sported an inlaid wood tie clip and I’m thinking we need to add some additional categories for best accessories. 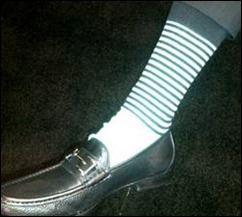 I’m declaring HIMSS 2015 to be “The Year of the Sock.” I saw more fetching hosiery this year than ever before. Special mention goes to Colin at the Patient IO booth. The socks were kind of a teal/aqua color with several accent colors below the shoe line, and coordinated perfectly with his bow tie and pocket square. His described his companies app as being “like Legos for patient engagement,” which drew my attention when I was fading partway through the exhibit hall. Speaking of bow ties and pocket squares, the Aventura team had it going on all week long with different combinations every day. 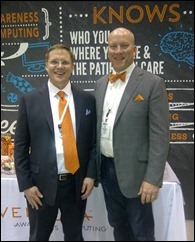 The ties, pocket squares, sweaters, Converse sneakers, and strappy sandals spotted at the booth were perfectly matched to their specific shade of orange, as were their giveaway candies. I didn’t know you could Pantone match M&Ms, but they just might have done it. I heard they also had cufflinks that honored their owl mascot, but I missed them. After my final lap around the show floor, it was time to head to the airport. I chuckled at the seat sign which promised no extra charge for payment by credit card since I was charged a processing fee every time I used an actual taxi. Usually I’m just changing planes at Midway and hurrying to another gate, but this time I had time to stop for lunch and more hydration at Harry Caray’s. I was people-watching when a vendor rep I haven’t seen in a while stepped up to the host stand. I waved him over and we caught up over a burger. He’s starting a new venture soon and I can’t wait to hear more about it. The other bonus of arriving at Midway early was being able to help welcome in an Honor Flight group from Kansas that was changing planes in Chicago. 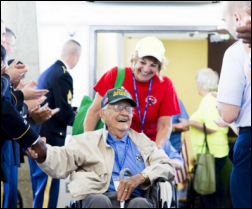 Honor Flight sends veterans to Washington, DC to visit their respective war memorials. This looked to be largely a group of World War II veterans. Travelers stopped and lined up a good way down the terminal, applauding as each veteran deplaned. The applause followed them down the concourse as they passed different gate areas. Many of their family members and escorts were moved to tears and I was as well. This generation sacrificed so much and being able to thank some of them really put the week in perspective. My flight home had multiple vendor reps still in booth attire, including scrubs. Everyone appeared tired and I almost had to use my doctor skills when a passenger nearly dropped her bag on our row while trying to get it in the overhead bin. “Heavier than I thought” almost caused a head injury, which makes no sense on an airline that checks bags for free. Based on the backpack (carry-on number three for her), she was a HIMSS attendee. Maybe a first timer – HIMSS is the one event I take my expandable suitcase to, because you never know what you might bring back. Thank goodness the folks at Medicomp agreed to ship the six gallons of popcorn I won playing Quipstar. As a reminder for those of you who are not road warriors: If you can’t lift it, it’s not a carry-on. The in-flight Wi-Fi allowed me to file most of my expense report before landing and I also had a chance to get caught up on email. One of my readers had reminded me on Monday that running would be my sanctuary this week. It had me wondering how many steps are in a HIMSS. Although I didn’t participate in the BYOD wellness challenge, I can state with confidence that it’s at least 65,000. I don’t know exactly because I didn’t wear my Garmin to HIStalkapalooza, so all that dancing didn’t get captured. I’m not sure on mileage since the data from the Garmin (29.2 mi) doesn’t match Garmin Connect (50.4 mi). I’m more inclined to believe the wrist unit, but I’m glad Garmin isn’t building healthcare software. 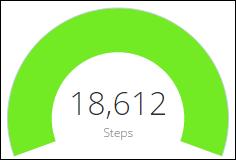 How many steps were in your HIMSS? Email me. My wife will be so happy to learn that the blue shoes she picked out for me are now somewhat famous!